← Introduing the Instant Human mitts! Okay, so I’ve decided to start another long term project. Ever since I finished the blanket out of sock yarn for my grandfather (which I still haven’t given to him! It’s sooooooo late it’s not even funny), I’ve wanted one for me. And I want to use up leftover sock yarn again. But I really don’t want to knit more squares on teeny tiny needles. Crocheted squares it is! After doing a little bit of math (O did the math, I just showed with my arms how big I want the blanket to be and the size of the squares), he told me I needed to make 864 squares. That means that if I make four squares a day, I’ll be done in seven months. Seven months people. Just to have a blanket. But I’m okay with that. Like I said, long term project. So far, on Friday I crocheted four and yesterday I made twelve. I’m hoping that I’ll make at least eight today. On the sidebar I’ve added a little entry thing where I’ll be keeping track of how many I’ve made so far. Oh and I’ve got quite a few FO pics to show you all, but those will have to wait for another day. 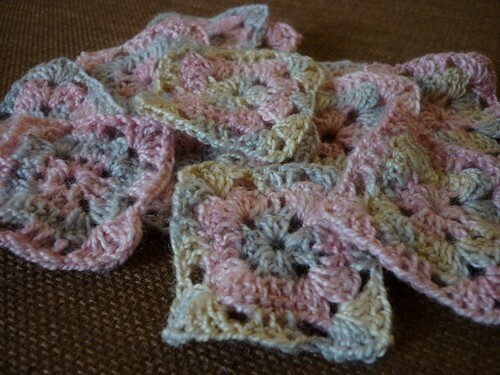 I need to go crochet me some more squares now.